The Leaders of the United States, Russia, China and India Must Take Action! We, the undersigned, appeal to President Trump, President Putin, President Xi Jinping and Prime Minister Modi, to convoke an emergency summit in order to create a New Bretton Woods global monetary system. Much of the world is in catastrophic disarray. There are acute dangers of a new financial crisis and of a potentially devastating trade war. The refugee crisis in the Mediterranean underscores both the plight of the people in Africa and Southwest Asia, and the disunity of the European Union. The demographic curve in the United States has taken an alarming downturn. For most ordinary citizens, it is very difficult to see how all these different problems can be efficiently addressed. There is, however, only one fundamental cause for all these seemingly diverse crises. When President Nixon effectively eliminated the fixed exchange rates of the Bretton Woods System in 1971, American economist Lyndon LaRouche warned that a continuation of the monetarist policies that were introduced then, would inevitably lead to the danger of a new depression and a new fascism, unless a new, more just world economic order were created. In the wake of Nixon’s action, there was a step-by-step deregulation of the financial system in the direction of neo-liberalism, which prevented the industrialization of the developing sector, and increased the profits of the speculators at the expense of the common good in the so-called advanced sector. The resulting systemic financial crisis of 2008 was not remedied by removing the causes of the crisis, but instead, the financial institutions of the British Imperial system acted to prolong the system of maximizing profits for themselves. As Lyndon LaRouche has emphasized for many years, there is only one combination of nations that is powerful enough to replace this currently hopelessly bankrupt neo-liberal system, and that is an alliance among the USA, Russia, China and India. It would represent, by far, the largest political, economic and military power, and thus be able to establish a New Bretton Woods System, in which sovereign governments control their own credit-creation, and can facilitate agreements among themselves to invest in the long-term development of infrastructure, industry and agriculture for the benefit of the common good of their people. The potential for such an alliance is very clear. China’s Belt and Road Initiative has been instrumental in bringing about the emergence of a completely new economic system, based on “win-win cooperation” among more and more countries, leading to an incredibly rapid eradication of poverty in many of them. New organizations, such as the BRICS (Brazil, Russia, India, China and South Africa) , the SCO (Shanghai Cooperation Organization), the EAEU (Eurasian Economic Union), and other regional organizations, are striving in the direction of a new economic order, based on the development of all. While this may not be obvious to many, the American System of economy based on the principles of Alexander Hamilton, which President Trump has promised to reintroduce, has a great affinity with, and is based on the same ideas as the Chinese economic model and China’s Belt and Road (or New Silk Road) Initiative. The leaders of Russia, China and India have already stated their intention to cooperate on Belt and Road projects in Eurasia, Africa and Latin America. Once President Trump has been freed from the British coup known as “Russiagate,” (which is now rapidly turning into a “Muellergate,” and leading toward a criminal investigation of the perpetrators of the coup attempt), he will be able to deliver on his promise to put relations with Russia and China on a sound footing. The only efficient way in which the many problems of the world can begin to be solved, is by the immediate establishment of a New Bretton Woods system–a new international credit system which makes it possible to increase the productivity of the labor force and to upgrade the physical economy. 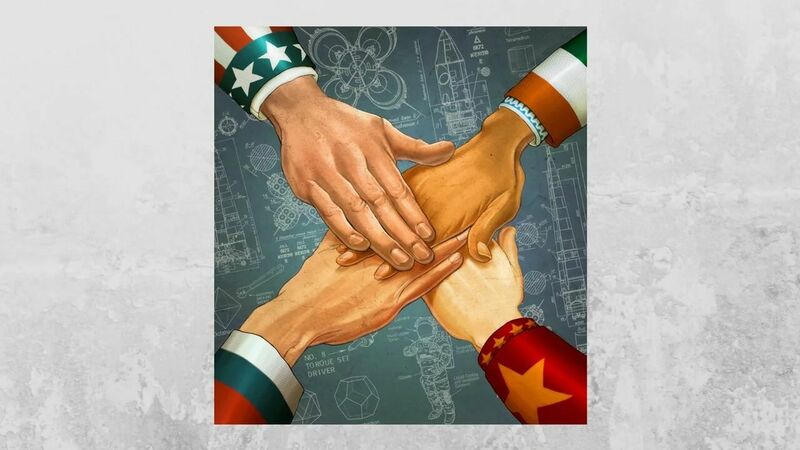 Once such a four-power agreement among the USA, Russia, China and India has been established, all other nations can join the new system, based on the principles of sovereignty and mutual respect for the differences in their social systems. We, the undersigned, appeal to President Trump, President Putin, President Xi Jinping and Prime Minister Modi, to convoke an emergency summit in order to create a New Bretton Woods System.